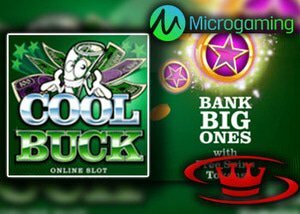 Microgaming has leaped into action this Spring with the release of the new Cool Buck Slot. This is the first new slot in April and is an updated version of the popular classic Cool Buck slot. It is an explosive edition that is packed with some exciting features that are, well "rather cool." Designed as a five reel, 9 line slot, it is fast-paced, energetic and includes several new features. The overall design and theme are somewhat simple, but that is a large part of its appeal and stands true to its original predecessor. Packed with player favourites such as free spins, stacked wilds, multiplier and scatters, Cool Buck Online slot offers a new feature that offers a new engine that is designed to make all spins exciting. When beginning play, a free spin counter is displayed above the reels, starting at five. Each spin has the ability to increase the free spin counter when a purple star is seen with one of the lower paying letter/number symbols. Free spins will trigger once three scatter symbols appear and will award the number shown on the counter. This can be as few as five, or as many as thirty. Microgaming Game Publisher, David Reynolds, mentioned that the company is pleased to see the Cool Buck online slot joining its game library. The new engine is one focused on providing the highest level of possible excitement for players and exceeds expectations. Roxy Palace Bonus Review is one of our preferred casinos that offers the new Cool Buck online slot and is offering new players an exclusive $10 Microgaming no deposit bonus. The no deposit bonus is awarded when you register a new real money account today. This will include a first-time deposit bonus of 100% up to $150 and a second deposit match bonus of 25% up to $200. Roxy Palace adds excitement each month with unique promotions such as its £20,000 Easter Extravaganza and its Rewards and Loyalty club. Register today to maximize your gaming experience playing Cool Buck Online Slot.